Taste test: It was very hard to get this bag open. I pulled and pulled and pulled, and eventually I managed to open it up. Once I got past that hurdle, it turned out that these are really good chips. They're thick, kettle-style, crunchy and have lots of very tasty onion flavor. Yum! Smell test: Oniony, pretty good. 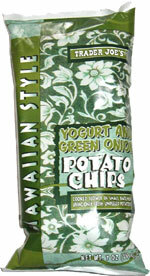 This snack was discovered by Keith and Melissa at Trader Joe's. Review published .